Started north on Highway 101. The weather had not improved: still cloudy, rainy, foggy and fairly chilly. Pulled into the aptly named Cape Foulweather for a shot of the coast, then continued north. Where I was, US 101 threatened to turn into one long nautical-themed strip shopping center -- seafood restaurants, boat charters, Made-in-Oregon souvenirs, etc. 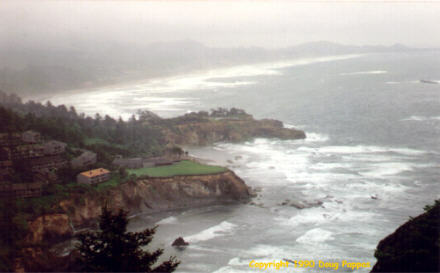 -- but once past Lincoln City the stores thinned out and the road became much more scenic. Too bad most of the scenery was obscured. A few miles further along I reached Astoria, western terminus of US 30. No sign announcing this fact, either, but since US 101 turned north to cross the Columbia on a large bridge, the start of US 30 was apparent. Detoured up a hill here to the Astoria Column, a 125-foot tower, erected 1926 on the highest point in town and covered with text and sketches depicting local history. The view from the top was spectacular, but unfortunately marred by 80-mph winds coming at me whenever I turned a corner. Since the walkway at the top was hair-raisingly narrow and I found it impossible to brace myself long enough to pan the surrounding area without being blown to one side, I didn't stay long. US 30 then turned inland a little ways and headed for Portland. There were a couple of things in Portland I wouldn't have minded seeing, but I was already behind schedule and didn't want to detour to find them. US 30 merged with the Interstate as it approached downtown Portland, and after a quick sequence of crossing from one interstate to another, I was headed eastward out of town on I-84, approaching the Columbia River Gorge. Unfortunately, the weather changed again, into one of the nastiest rainstorms I'd seen in a while. Even at top speed, the wipers were far outmatched. Driving 65 mph through unfamiliar territory on an Interstate, with little visibility, lots of cars on the road and occasional construction to boot, was not fun. I went past the Gorge turnoff to the next exit, which had a large truck stop where I could get gas and wait out the storm. By the time I'd paid for the gas, made motel reservations for the night, and bought a burger-to-go for lunch, the worst of the storm had passed. 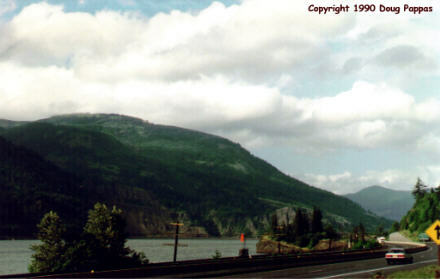 I backtracked and got on the Scenic Columbia River Highway, laid out circa 1915. Though it wasn't labeled as such, this was also the original US 30; sometime thereafter, US 30 was moved to the coast, and subsequently widened to become the Interstate. This was the only stretch of the trip where I was bypassing a road designated at US 30, but given the history I felt justified in doing so. After the road meandered for several miles -- nothing special, traversing residential and commercial areas -- I reached the first significant vantage point, the Vista House at Crown Point (built 1916-18). From here I could see up and down the Gorge from a promontory; the view would have been spectacular except for the low-hanging rain clouds which persisted throughout much of the afternoon. From there I continued down the road to the area of the waterfalls. I'd forgotten that these falls weren't on the Columbia, but rather involved streams which flowed into the river. First came 249' high Latourell Falls, with a path running to its base. This fall seemed a lot more impressive than most of the ones I'd see in Yosemite seven weeks earlier -- although shorter, they carried much more water, and the observation points magnified the sound and effect of the water hitting the ground below. I hiked around Latourell Falls, then did the same at Bridalveil Falls and the 242' high Wahkeena Falls. The big one, Multnomah, still lay ahead. Multnomah Falls was clearly the star of the bunch. It had its own lodge, containing a restaurant, gift shop, snack bar and restrooms; also the biggest parking lot and the most extensive network of trails. All of this was quite justified, though: at 620', Multnomah was the fourth highest waterfall in the country (Yosemite Falls is a clear first...then what?) The first drop alone falls 542'; the lower drop, another 69'. In addition to the typical observation deck at the base of the falls, the folks who had developed the area in about 1915 had constructed a bridge just above the lower falls and, for those of us who felt especially strong or foolhardy, a 1.1 mile trail to the top. I walked. Doing the math indicates that this trail had to average about a 10% gradient over its entire length -- especially remarkable given that the trail actually runs PAST the top of the Falls and requires a short series of downward switchbacks to the observation point. 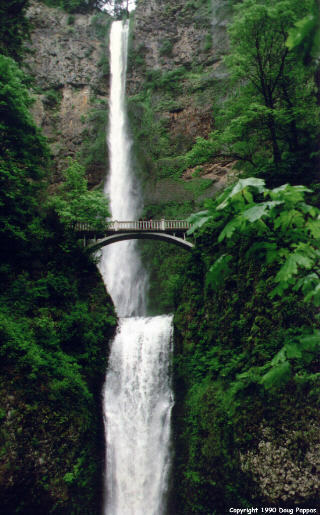 Multnomah Falls marked the end of the Scenic Columbia River Highway attractions. A few miles further east, the Scenic Highway rejoined the Interstate, and I continued on at a much faster clip. At the junction with US 97 I turned north a few miles toward Maryhill, the Sam Hill estate overlooking the Columbia -- I wanted to find the Stonehenge replica he'd built. Took me four false starts and misdirections, and about 25 wasted minutes, to locate Stonehenge and identify the road which would lead me to the plain on which it was built. When I arrived at about 8:00, I was the only visitor; I wandered the grounds a few minutes before returning to the main road and continuing to LaGrande for the night.